This is one of those recipes that has 487 million variations. Everybody has one. But the truth is, it’s just too delicious not to share here too. And did I mention it’s easy? Like brown some meat and open a few cans easy. But it tastes like so. much. more! So here’s my family’s version. We’ve been making it for years. I love it served over rice, but know lots of folks that like it with some corn chips on top. It’s also great with some shredded cheddar and a dollop of sour cream. Honestly, I’ll take it just about any way I can get it. 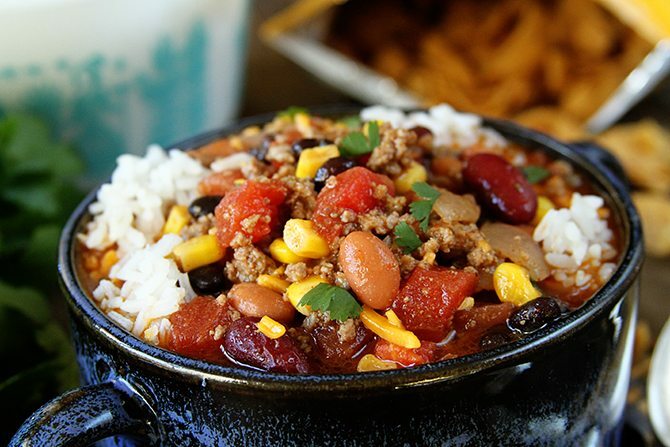 It packs a punch of flavor that is reminiscent of chili. I know y’all will love this one. It’s a recipe we use over and over again. I think I’ve got it memorized now! In a large stock pot over medium-high heat, brown the ground beef with the onion. Once cooked through, drain the grease away and return the meat and onion to the pot. Drain and rinse the three types of beans. Drain the corn. Add the rinsed beans and drained corn to the pot. Add the undrained tomatoes (all undrained) along with the taco and ranch seasoning and water. Stir to combine. Heat until boiling. Reduce and simmer for 10 to 15 minutes. Serve over rice or with corn chips. Add a dollop of sour cream and a sprinkle of cheddar cheese, if desired. Can measurements might vary for brand to brand. As long as you use something close to these, the recipe will work just fine. They don't have to be exact. 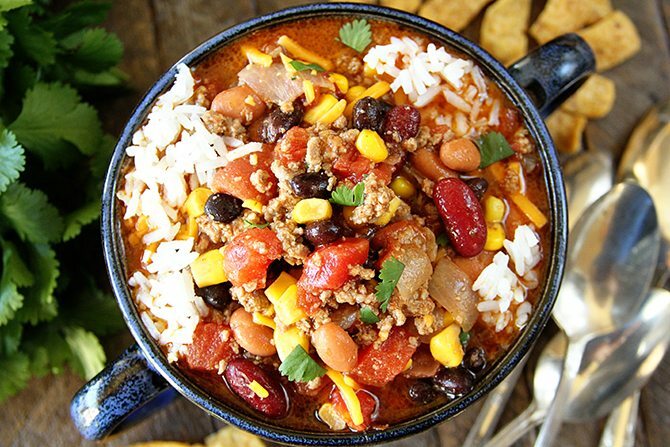 The brand of taco seasoning will drastically change the flavor of this soup. Choose your favorite. Mine happens to be McCormick. 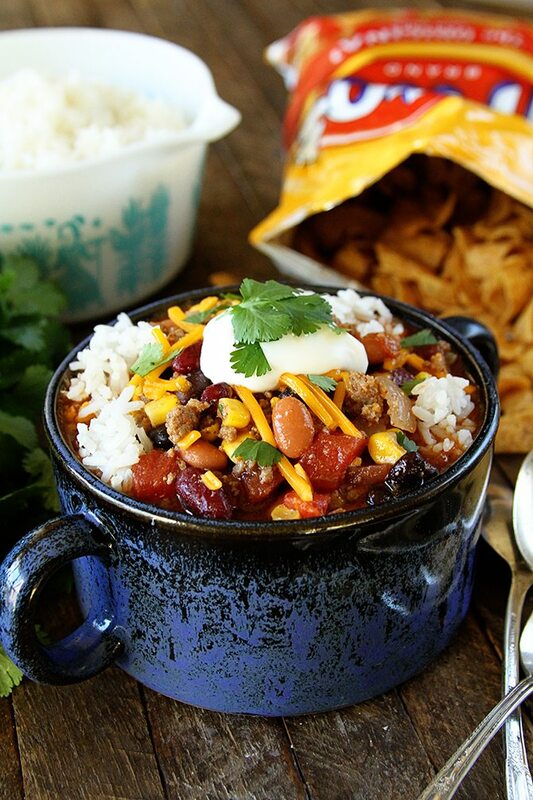 Taco soup sounds awesome for the winter. Can’t wait to try this! The only thing is I would NEVER use those packets of taco seasoning or ranch seasoning. Of that long list of ingredients, SPICES is number 8?? Do yourself a favor and mix up your own seasonings or get them from a good source. Yum! Its so blustery outside that I am all about soups right now! This recipe sounds wonderful and I’m looking forward to making this soon. I’m thinking I would like to make this in the crockpot. 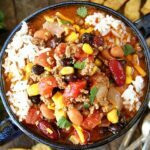 What are your thoughts on crockpot preparation? Any changes? Trish, my family always does ours in the crock pot and it works out just perfectly. As a matter of fact, we had it at our daughter’s on Monday night and it was delicious. She put it in on Monday before she left for work on low, and it was ready when we got there. ENJOY! Yes, it works perfectly! Thanks for sharing, Michele! It works beautifully in the crock pot. Just brown your meat and drain it, then combine everything in the crock pot. Enjoy! I am one of those rare people that hate Regular Ranch dressing. 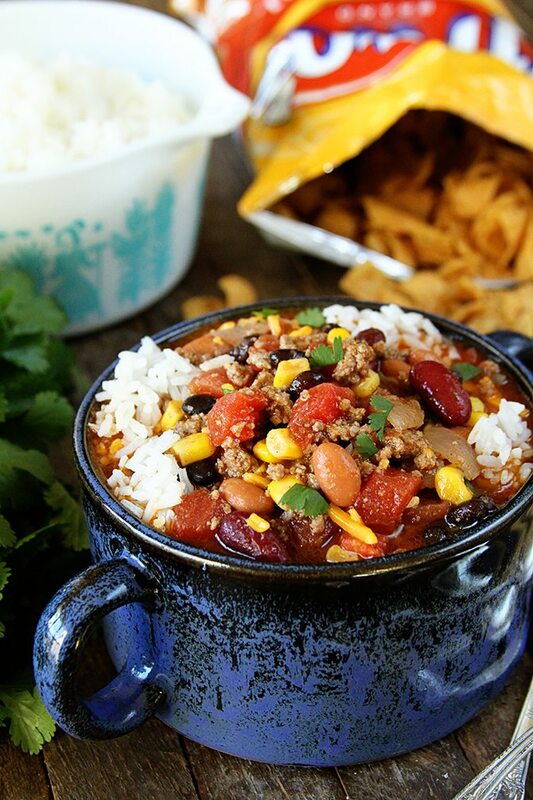 Instead I use the Fiesta Ranch or the Spicy Ranch flavors in my taco soup, and love it!! CAN YOU MAKE THIS IN CROCK POT? I SURE HOPE SO. Sure can! Just brown the ground beef in advance, drain it, then combine everything in the slow cooker. Enjoy! I need more recipes like this – that look irresistible and offer families lots of options. 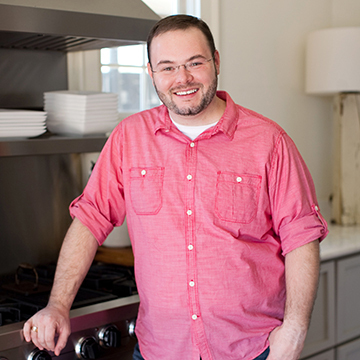 Thank you for sharing great recipes that are easy to follow and don’t take all day to prepare. I hope this is the year that I can finally streamline the cooking process. Thanks for everything you do! I totally understand, Karen! I share recipes with y’all that we actually eat, so most of the time that’s stuff that’s quick and easy. I sure hope you’ll enjoy this one! I’ve made taco soup every which way but loose. Mostly chicken versions. My family loves taco soup so it’s almost a weekly occurrence. I’ve done the ones where you put all the canned beans in and the canned corn. I usually turn my nose up at the ones with seasoning packets. Well, I tried this one exactly as directed. Bought those seasoning packets. I gotta tell you, man. This one was the bomb. I mean the bomb in a good way, like back in the 90’s. I never would have thought of ranch seasoning for a taco soup. My teenager scarfed that down like there was no tomorrow. And I did do. Loved it. I have finally found the taco soup recipe of my dreams and I’m not ashamed to admit it comes with seasoning packets. You only live life once. I couldn’t love this comment any more than I do! I’m so glad you gave it a try and that it turned out great for you. I know folks are afraid of the seasoning packets, but they honestly add SO MUCH FLAVOR! I’m just tickled y’all enjoyed it! 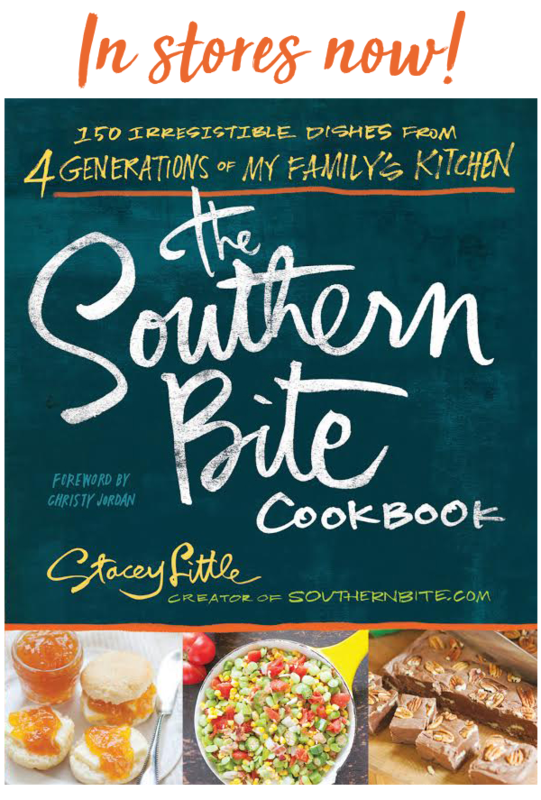 Stacey, this looks so good! I think I’ll try it next weekend. Thanks for the recipe. By the way, your photography is always excellent, but I have to say these photos are stunning. Nice work! Awww, you’re so sweet! Thanks so much! Please make a homemade taco seasoning mix. I hate those packets, and I’ve tried every brand for taco seasoning!! Thank you! How many people does this recipe serve? Thx! Trying it now. Lots! 8 to 10 or even more depending on the serving size.